Marlon Brando was such an incredible actor that he set the standard by which all other actors would be measured. He was one of the first actors to perform in the newly introduced acting style called “The Method”. This technique involved utilizing one’s own repressed memories and emotions to portray a character, resulting in a more emotional and realistic performance. And Brando had a lot of material to draw from. Brando was born on April 3, 1924 in Omaha, Nebraska to Marlon Brando, Sr. and Dorothy Julia Pennebaker Brando. Marlon Sr. was a salesman and Brando’s mother worked at a local theater as an administrator and actress when she could. His father was distant and abusive when he was home, which wasn’t that often. Both parents were alcoholics and fought whenever they were together. Brando had two older sisters: Jocelyn, the eldest, had hopes of becoming an actress and Frances, the younger, wanted to pursue a career in art. Brando’s first experiences play-acting were for his mother, in an attempt to entertain her and gain her affection. She was a smart, talented woman, but unconventional for her time; she smoked, wore slacks and drove an automobile. She got Brando interested in the acting profession through her work as both an actress and administrator at the Omaha Community Playhouse. While working at the theater she was mentor to a young, and as yet, undiscovered Henry Fonda. 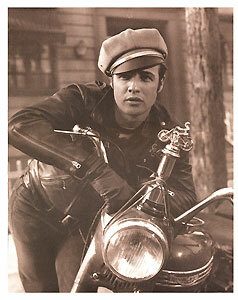 Always rebellious, Brando was expelled from high school for riding his motorcycle in one of the buildings. At sixteen his father got him into his former school, the Shattuck Military Academy in Minnesota. Brando did well in sports and very well in theater there, although his grades were appalling and he still struggled with authority figures. After talking back to an officer he was put on probation and not allowed to leave campus. After violating the probation, he was expelled, but on review was invited back. Brando decided not to return while he considered his options for the next six months while he worked digging ditches. A knee injury sustained while playing football at the Military Academy exempted Brando from serving in WWII. Shortly after his sisters left for NYC to start their careers, Brando followed them in 1943 to pursue his dream of becoming an actor. Brando enrolled in the American Theatre Wing Professional School, the New Dramatic Workshop and the Actors’ Studio. He worked doing summer stock on Long Island and was invited to perform in I Remember Mama on Broadway in 1944. His first performance was a great success and he received offers from talent scouts to do a screen test, but he refused, because he didn’t want to be held to the standard seven-year studio contract. Although his 1944 stage performance in Truckline Café was a commercial failure, critics voted him “Broadway’s Most Promising Actor”. Brando became a star after his stage performance in Tennessee Williams’ A Streetcar Named Desire in 1947. The audience found him magnetic, unable to take their eyes off him. His part was rewritten to give him more time on stage. His role as Stanley Kowalski resulted in a screen test with Warner Brothers who were considering him for the lead role in Rebel Without a Cause, which he made later in 1955. 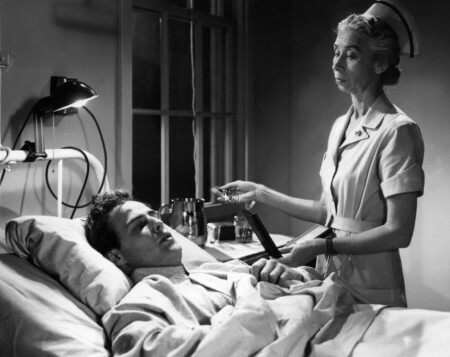 Brando’s first screen role was playing a paralyzed veteran in The Men in 1950. In order to prepare for the role, he laid in bed for a month at a veteran’s hospital. 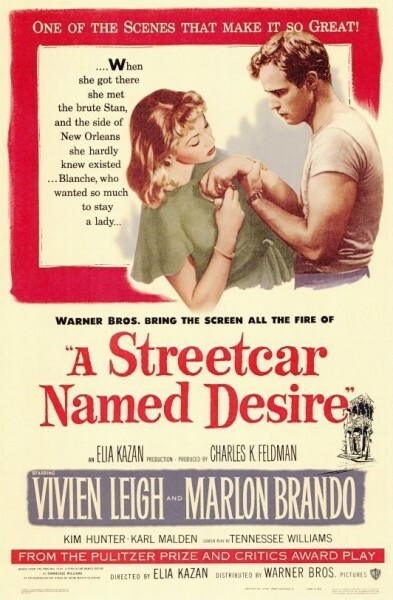 In 1951 the screen version of A Streetcar Named Desire was released and Brando was nominated for an Academy Award for Best Actor. He was nominated for Best Actor for the next three Awards ceremonies for his lead parts in Viva Zapata! in 1952, playing Mark Antony in Julius Caesar in 1953 and for his role in On the Waterfront in 1954. Brando’s star continued to soar steadily upward through the late 1950s. But his career stalled in the 1960s as he developed a reputation for being difficult and causing films to run over budget. Many felt the roles he did throughout the ’60s were beneath his dynamic talent. The 1972 blockbuster movie, The Godfather, in which he played Vito Corleone proved to be the turning point for Brando’s career. He was cast after Francis Ford Coppola went to bat for him with reluctant studio execs. Author Mario Puzo had Brando in mind for the part from the start. Brando won the Academy Award for Best Actor, and the movie lives on, not only as one of the best movies ever made, but as part of out popular culture. Lines spoken by the characters are frequently repeated on TV sitcoms and in everyday conversation. Brando followed his Godfather performance with another win for Best Actor for his role in the controversial Last Tango in Paris (1973). He was reportedly paid $1 million a week for his role in Apocalypse Now – a role he was poorly prepared to play as he hadn’t read the book as instructed to by Coppola. Brando got an amazing $3.7 million for two weeks of work in the 1978 Superman movie. He demanded not have to memorize anything and spent very little time on set. He continued to do small roles late in his career, including poor reviews for his role in The Island of Dr. Moreau. He was also in A Dry White Season in 1980, The Freshman in 1990 and Don Juan DeMarco opposite Johnny Depp in 1995. Brando’s continuing weight gain caused the onset of diabetes. And on July 1, 2004 Brando died from complications brought on by the disease, as well as liver cancer. He was 80 years old, had been married 3 times and had fathered 8 children, both in and out of wedlock. He spent much of his life fighting for racial equality and was an outspoken advocate of American Indian rights. He was determined to leave the world a better place than he found it. Marlon Brando will continue to live on through his films and in the legacy of acting he left for anyone pursuing the career today. He is considered by many to be the world’s greatest actor.